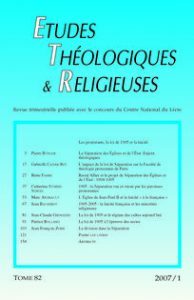 The 1905 law and its legislative additional texts voted from 1907 to 1924 is only one element of the régime of cults in France today. According to Jean-Claude Groshens, religious communities developed rights that were added on top of the too limited principle of separation between Church and State. These rights benefited ancient recognized cults, especially the Catholic Church, while the 1901 law on the rights of associations allowed all religious groups to organize themselves outside the quite favourable yet narrow frame of the 1905 law.